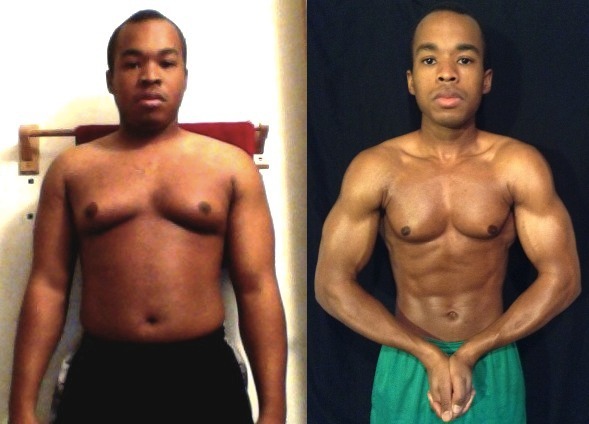 Here’s your latest essay interview with 7th place winner Elijah Smith from the 15th Adonis Golden Ratio Transformation Contest. Before doing AGR, my prior workout routine was HIIT-based; I had bought into the notion that high-intensity circuits were best for both building muscle and losing fat; and since the workouts were shorter, I thought that would give me the best of both worlds: less time and better results. As far as my nutrition routine, I mostly just ate when I wanted to, and didn’t pay any attention to calories or protein at all. The results I ending up getting from that approach were two-fold: increased frustration from being unable to stick with the workouts, and fifty pounds of excess body fat from the unlimited calorie intake. I first found out about AGR somewhere around 2010, shortly after I had purchased the latest version of Eat Stop Eat. I was watching some videos about Eat Stop Eat on YouTube, when I came across a video of John Barban and Brad Pilon talking about their new workout program for men. 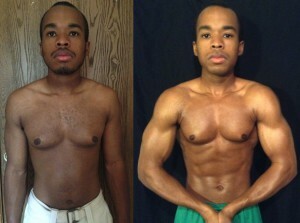 At first, I thought it was a scam; the idea of building the “perfect” body seemed too good to be true. However, after watching the whole video, reading some reviews, and skimming the sales page, I decided to take the plunge and purchased the AGR program. I figured, “What do I have to lose? There is a money back guarantee.” When I finished reading the Main Manual, I realized that this concept of a perfect body wasn’t totally made up, and that it was, in fact, based on a large compendium of research and data. 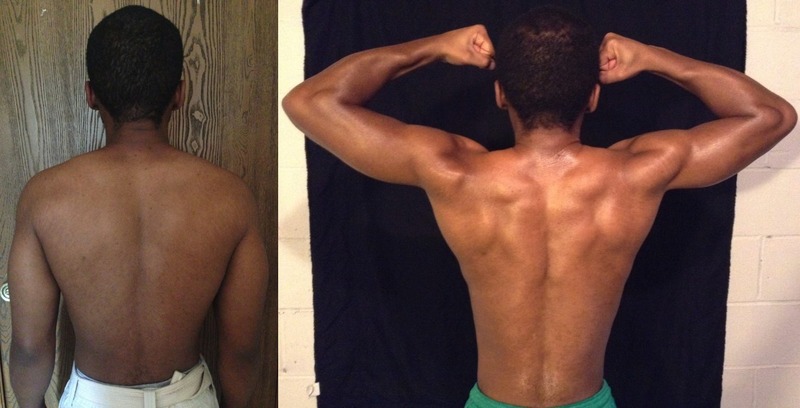 There were two things that appealed to me most about AGR: that I didn’t have to do any HIIT style workouts, and that I didn’t have to follow any complicated dietary guidelines. The first workouts I ever did were basic weight-training workouts; we had a class called “Fit for Life” in high school, and it was mandatory. In that class, we learned how to lift weights properly, and were then given a workout plan for every week of the semester. The thing is, those kinds of workouts were doable for me; I enjoyed them, and I made a lot of progress (I both built muscle and increased strength). In retrospect, I realize that my goals became hijacked a short time later, and I began to believe that HIIT-style training was better, even though I didn’t enjoy it very much (part of this was due to the fact that it was shortly after this that I got involved in martial arts, and I wanted to improve my work capacity so that I could spar and train longer). I really liked the fact that AGR didn’t have a “bad foods” list, nor did it have a pre-planned menu, nor was I required to measure and weigh every gram of food, nor eat at a specific time(s) of day, nor have a specific ratio of macronutrients. One of the reasons it had been so hard for me to lose weight in the past, was that I felt I had to restrict the types of food I was eating (i.e., most of the foods that I actually liked to eat); the fact that I can eat whatever and whenever I want (keeping calories in mind, of course) made this diet so much more sustainable. 4- Were there any concepts or approaches you were skeptical about? 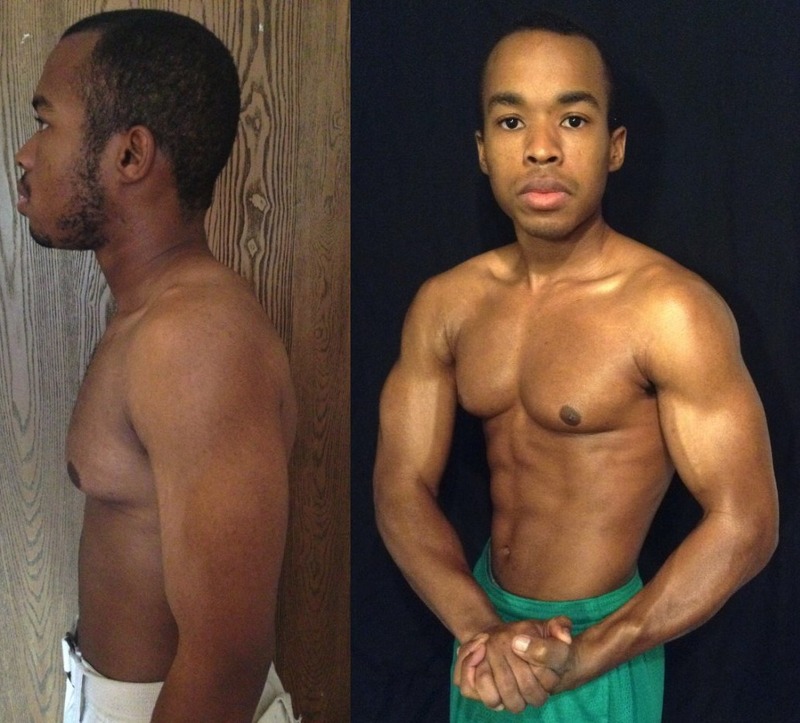 I decided to jump on board full-fledge with AGR in 2013, after trying a number of other diet approaches, and seeing no noticeable results. It was then that I decided I would ride this train as far as I could, and I began the yearlong process that would culminate in where I am today. I wanted to make sure that I didn’t repeat the mistakes I made in the past, where I tried to do too much and lose the weight too fast (only to rebound later). This time, I took the tortoise approach: slow and steady, and it definitely paid off in ways greater than I ever imagined. I have attempted to enter so many contests in the past few years, I’ve lost count; however, the earliest contest I remember entering was AT-10. My experience going through the AT-15 contest was filled with a plethora of different emotions: fear, excitement, astonishment (at times), uncertainty, regret, and pride. There were two major challenges that came up: perfectionism and my mother. There were days when I ate double the calories that I was planning to eat, and I felt the temptation to just give up, because all was clearly lost. I had to constantly remind myself of the 80/20 principle: that staying on track 80% of the time will get me to my goals; I didn’t have to be perfect. Another big challenge for me was the negative feedback that I received from my mother; she would constantly express concerns that I was losing too much weight, that I looked emaciated, and she even expressed concerns that I was anorexic/bulimic, despite the fact that I ate a lot, and told her that I like food (perhaps too much, which was why I had the excess fat I did in the first place). Learning to ignore her criticisms was perhaps the biggest challenge that I faced all along the way. I had to come to the realization that I was doing this for me, and no one else. Since no one else has to live my life, it doesn’t make any sense to let someone else chose what’s best for me. In going through a transformation, I have realized the important role that environment plays in your success; if there are a lot of stressors around you, weight loss can become next to impossible. However, by either mastering or removing yourself from a stressful environment, your ability to stay on track increases exponentially. Most of the people I knew reacted positively. It was very encouraging when people would ask me if I’d lost weight, even though I had never mentioned to anyone that I was in the process of reshaping my body (a la covert nutrition); that’s how I knew that I was doing something right. As I mentioned before, the one person that reacted negatively was my mother. I have also noticed that I seem to get more positive attention than I did before, both from total strangers and people that I have known for a while. Sometimes I wonder how much of this is from my increased confidence at the fact that I feel good about my own body, and how much is from the “Adonis Effect,” relative to the increase in my AI. To be honest, I’m still surprised when I look in the mirror. I often ask myself, “Is that really me?” It’s as if I imagine that I’m going to look in a mirror one day and magically be 50 pounds overweight again. Other than the regular reminders that this is, in fact, the real me, I am very happy with my results, and they are what motivate me to keep working hard so that I can push even further to achieve true golden. I have noticed some profound changes in my outlook and attitude; I find that now I am much more passionate about life, about doing everything that I can to make it the best that it can be. I also find that I am able to better exercise self-control in other areas of my life, areas where I have also previously struggled (e.g., finances, delayed gratification in general). Major kudo’s to you as well for surviving criticism from your mom. I know it must’ve been hard at times as she didn’t understand your fitness goals. It sounds like she was a strong influence and I’m sure she meant well. At the end of it all congrats on making it to the other side and I hope that the “Adonis Effect’ continues to work in your favor on your journey of the Adonis Lifestyle.